NASA and the Russian Federal Space Agency have agreed on a Nov. 14 date for the first manned Soyuz rocket launch since the failure of a similar booster carrying a robotic cargo ship last month. The decision follows an investigation by Russian space officials to identify the source of that failure and ensure it won't plague future launches, NASA announced today (Sept. 15). 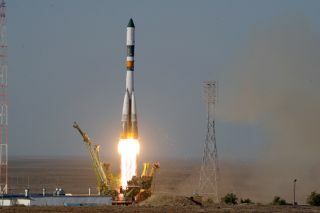 It also clears the way for a new three-man crew to launch on the Soyuz to the International Space Station, sustaining the orbiting lab's 10-year streak for a continuous human presence in space. "Our Russian colleagues have completed an amazing amount of work in a very short time to determine root cause and develop a recovery plan that allows for a safe return to flight," International Space Station program manager Michael Suffredini said in a statement. The accident forced NASA and Russian space officials to consider evacuating the International Space Station if the Russian rockets could not be proved safe in time to launch the next crew. The six astronauts currently living on the station are due to return in September and mid-November. Three members of the crew will land overnight tonight (Sept. 15) at 12 a.m. EDT. In the wake of this summer's retirement of NASA's space shuttles, the Soyuz is the only means of transportation for people to the station. Now, it appears unlikely that the outpost will have to be left without a crew. "Our top priority is the safety of our crew members," Suffredini said. "The plan approved today, coupled with the conditions on orbit, allow the partnership to support this priority while ensuring astronauts will continue to live and work on the station uninterrupted." The next manned Soyuz launch will follow an unmanned Soyuz liftoff in mid-October, Russian space officials announced earlier this week. An earlier report suggested the space agency was targeting Nov. 12 for the next Soyuz flight, but that date has been pushed back two days. Three spaceflyers — NASA's Ron Garan and Russia's Andrey Borisenko and Alexander Samokutyaev — are slated to fly home from the station later today. Mike Fossum of NASA, Satoshi Furukawa of Japan and Sergei Volkov of Russia will stay onboard the orbiting laboratory for another 61 days, departing on Nov. 22. "We'll have a longer period of three-person operations and a shorter than usual handover between the next two crews, but we are confident that the crews will be able to continue valuable research and execute a smooth crew transition," Suffredini said.